Meg here, and I know just how much work goes into running an office. Not only do you have all the employees, but clients, vendors, property managers and more. Our office administrator is our savior for all these things. Here are a couple reasons we love our office administrator and ways to make their day a little better as we celebrate national Administrative Professionals Day! Gift Shower: A card is a great start, but this year you can take it a step further and throw a little gift shower. The gifts don’t need to be big, even the smallest personalized gifts can make an impact. Whether you have a basket waiting on their desk at the beginning of the day or have various coworkers stop by with little surprises and notes throughout the day, your office administrator will feel appreciated all day long. A Day Off: While it may seem that your office work flow will crumble without them at the helm, your office administrator surely deserves a little break! Whether you can manage an afternoon or even a full day, let your office admin schedule some downtime out of the office. You can also surprise them with tickets to an event, a spa pass or a gift certificate for a sweet treat to enjoy during their time off. Help Out: Take a day to walk in their shoes! While your whole office appreciates all the work that your office administrator takes on, it’s a different story when it comes to experiencing it yourselves. Create a schedule and have each member of the office sign up to take over or help out with various tasks that your office admin works through daily. Not only will you give them a break, you’ll have a new appreciation for all the hard work they do every day. Update Supplies: It may seem like a small gesture but new supplies will make your office administrator's job easier. A great place to start is by replacing storage boxes or bringing in a few new ones for those stubborn files that need a home. One of my favorites is Bankers Box®. Those boxes get worn out so quickly with every day use and a few new ones will go a long way in making your office administrator's job a little less stressful. A new set of pens, a stylish new desk organizer, or even a cute new notepad will make a big difference as well. Administrative Professionals Day is a great opportunity to show your appreciation for all that your office administrator does to make each day flow smoothly. 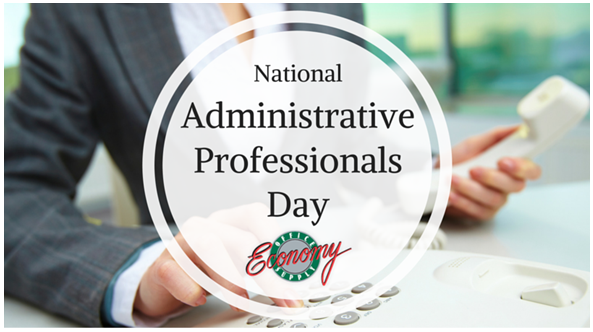 With these tips, your office administrator will feel appreciated all day long. I think it’s a great idea to keep that appreciation flowing all year round by remembering to thank them for their hard work each day. If you’re looking for a few other ways to make this day extra special check out these great ideas CLICK HERE.